universal part // Scooter Shop Zeibe Moto Helmet Deodorant Spray Dealership Dispaly Zeibe Spray Bike Store Display 16x100ml - The Perfect Gift for Scooter & Motorcycle Riders! Scooter Shop - Scooter Dealer display box of 16 100ml helmet display deodorants perfect for the sales or exhibition counter. Packaging coverts to a purpose made display stand. Bad smells in the helmet occur automatically due to sweat, moisture and road dust. 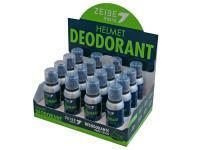 Zeibe helmet deodorant eliminates odours and kills bacteria and fungi from the inner lining of the helmet. 4-5 sprays after each use, let it dry and the helmet has a pleasant fresh smell again. Zeibe puts the helmet back in a hygienic condition. Particularly useful for helmets without removable lining or simply if the use of the washing machine seems too complicated. Pack with 16 100ml bottles (without propellant). Compliance with directives 67/548/EEC, 1999/45/EC and their amendments.